Lawrie Wilson during his Posh debut at Sheffield United. Photo: Joe Dent/theposh.com. Peterborough United have bolstered their injury-hit defence by signing Bolton Wanderers full-back Lawrie Wilson on loan today (January 2). Wilson (28) used to play for Posh boss Graham Westley at Stevenage where he spent five years before winning a move to Championship side Charlton. Wilson made just over 100 appearances for Charlron before moving to Bolton in the summer. He made nine appearances for the struggling Trotters, but hasn’t played since September 19. 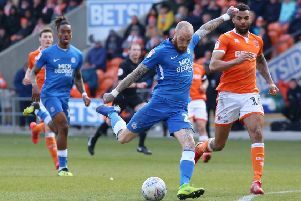 Wilson made his Posh debut in today’s League One game at Sheffield United as a half-time substitute.